The PD-4006 Security Gateway Appliance can be configured as a firewall, LAN or WAN router, VPN appliance, DHCP Server, DNS Server, and IDS/IPS with optional packages to deliver a high performance, high throughput front-line security architecture at an excellent price. 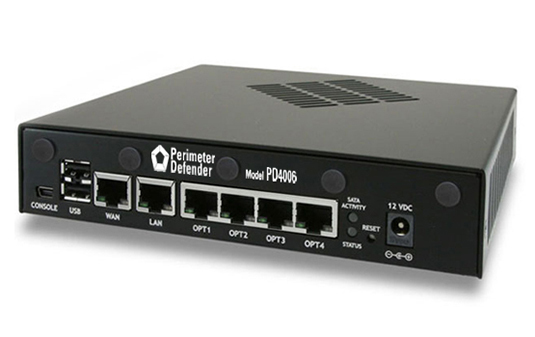 With preloaded Perimeter Defender software, the PD-4006 is a fast networking security solution unencumbered by traditional annual contracts, licensing fees, or artificial limitations. Built with performance, versatility, and low total cost of ownership in mind, this is a low power system built for long life and solid reliability in a compact footprint.